TEPCO’s announcement about the extent of the fuel damage in Unit 1 came about last week when workers calibrated water-level sensors and found that the water level in the reactor vessel appears to be below the level where the bottom of the fuel rods should be in normal operation, and appears to have been that low since shortly after the earthquake and tsunami. This means that the fuel could no longer be in its usual location since without cooling it would have melted. On May 15, TEPCO released details of its current guess about what happened in the core. This analysis says that most or all of the core had melted and relocated to the bottom of the reactor vessel within 16 hours of the time the reactor shut down. This analysis assumes the cooling system “lost its function after the tsunami arrived at around 15:30,” so relocation of the fuel happened within 15 hours of the end of cooling. 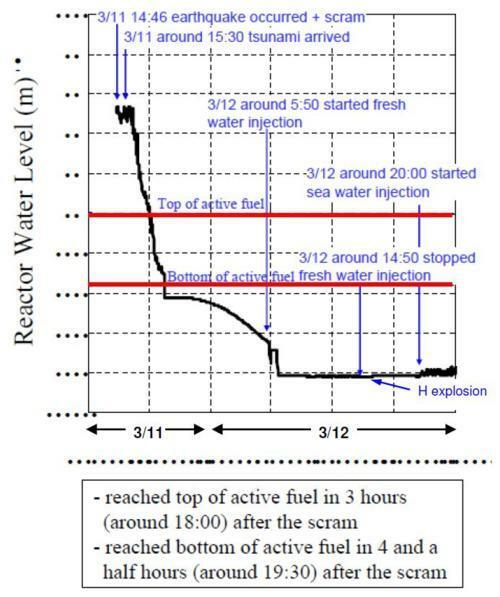 Figure 1 below shows what TEPCO believes the water level was in the Unit 1 reactor during the first 33 hours of the crisis, according to its new analysis (the vertical dotted lines mark 6-hour increments). The red lines show the top and bottom of the fuel assemblies under normal “active” conditions. According to Figure 1, the water level dropped to the level of the bottom of the fuel within about 4 hours after the earthquake hit and the reactor shut down. And it stayed there despite workers’ attempts to pump first fresh water and then sea water into the reactor. It has apparently stayed at that level since then, although faulty readings from the water-level sensors led workers to believe it was actually much higher. The fact that the water level was this low despite water being pumped into the reactor suggests the cooling water is leaking out. Figure 1: Results of a TEPCO analysis, adapted from, “Reactor Core Status of Fukushima Daiichi Nuclear Power Station Unit 1,” 15 May 2001. I’ve marked the time of the explosion in Unit 1, believed to be due to hydrogen created by the damaged fuel, which occurred at 3:30 pm on March 12. This is about 20 hours after TEPCO believes the fuel was exposed to air. The water level in Unit 1 is believed to have dropped much faster than for Units 2 and 3. Why would this have occurred in Unit 1 and not Units 2 and 3? It’s possible it was due to whatever specific damage was caused by the earthquake and tsunami. A recent press story suggests instead that a worker may have shut down Unit 1’s cooling system shortly after the earthquake hit, causing the water to quickly boil away. But Dave Lochbaum notes that Unit 1 had a different “water makeup system”—which is used to keep water levels where they should be—than Units 2 and 3. Moreover, even if the cooling system had not been shut off by a worker, it would have failed shortly on its own. Unit 1 did not have the steam-driven vessel makeup system that was installed and used on Units 2 and 3. Unit 1 had what is called an isolation condenser to perform vessel water inventory control and vessel pressure control (see Figure 2). The isolation condenser is a large tank of water. If the normal makeup flow of water to the reactor vessel is lost, battery-powered valves open to allow steam produced by decay heat in the reactor core to flow through thousands of tubes in the isolation condenser. That steam is condensed back into water and flows by gravity to the reactor vessel. 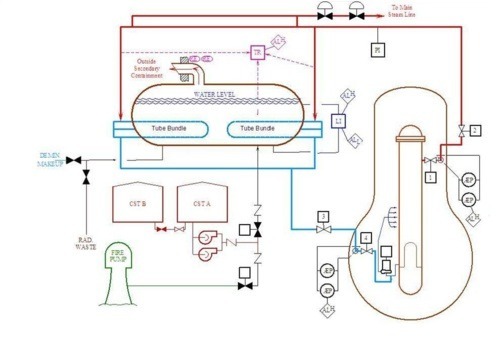 This process controls the amount of water in the pressure vessel, since it limits the steam (and thus water) lost through relief valves to the torus (which is part of the primary containment vessel). This process also controls the reactor vessel pressure, since the water in the isolation condenser absorbs decay heat that would otherwise cause the pressure inside the reactor vessel to rise. But the water inside the isolation condenser is of finite volume. In less than 90 minutes after a reactor shut down from 100 percent power, the decay heat from the reactor core will have warmed that water to the point of boiling and begun to boil it away. Boiling water reactors with isolation condensers are supposed to use electric powered pumps to refill the isolation condenser tanks well before its water boils away. Workers at Fukushima had no pumps available to top off the tank after the earthquake took away the normal power supply and the tsunami took away the backup power supply. With the loss cooling from the isolation condenser, the decay heat from the reactor core boiled away the water from the reactor vessel, exposing the fuel in the reactor core. Units 2 and 3 would have used their steam-driven makeup pumps to control the reactor vessel water inventory and pressure for at least 8 hours after the tsunami damaged the backup power supplies, until their batteries were depleted. Depending on whether the Unit 1 was shut down or boiled dry, it was 6 to 8 hours ahead of them on the path to reactor core damage. Figure 2: A schematic showing the isolation condenser at the upper left. The blue lines show the water flow from the reactor vessel—the cylinder on the right surrounded by the inverted lightbulb shape, which is the primary containment vessel. It’s worth noting that modeling of the crisis indicates that meltdowns should have occurred at all three reactors (1. 2, and 3), given the length of time they were all without cooling. The modeling also suggests that without cooling the molten fuel would have melted through the bottom of the reactor vessel about 7 hours after the fuel relocated to the bottom of the vessel. TEPCO says that cooling water was injected in to prevent this. According to Figure 1, the injection of cooling water started about 10 hours after the water level dropped below the bottom of the fuel in the reactor. Finally, much of the confusion about what’s happening in the reactors results from the lack of operating or trustworthy monitoring sensors, since many of the sensors were damaged by the earthquake or tsunami. This illustrates the need for diverse, reliable monitoring equipment backed by sound guidance for the operators to apply in event of unavailable or inaccurate instrumentation readings. The lack of reliable sensors was a problem after the TMI accident in 1979, and remains a problem more than 30 years later. David Wright, physicist and co-director of the UCS Global Security Program, is an established expert on the technical aspects of arms control, particularly those related to missile defense systems, missile proliferation, and space weapons.